NJCA had led a relentless campaign to seek upgradation of minimum salary to Rs 26,000, instead of Rs 18,000 proposed by 7th Central Pay Commission. New Delhi, Jan 4: National Joint Council of Action (NJCA) convenor Shiv Gopal Mishra once again lashed out at Centre for not paying heed to the demands of aggrieved central government employees. Mishra, who also heads the All India Railwaymen’s Federation (AIRF), claimed that he is personally pained since the government has ignored the genuine demands raised on behalf of employee unions. Mishra listed two of the most genuine demands which he wanted Centre to fulfill: Upscaling of minimum salary to Rs 26,000 and enabling Old Pension System for employees hired on and after 1st January, 2014. "In the recommendations of the 7th CPC both the demands were ignored," Mishra said in his statement issued for AIRF. He further added, “held meetings with the Cabinet Secretary, Secretary(DoP&T), Secretary (Exp.) etc. of the Government of India, to extract maximum benefits for all of you, but up till now nothing fruitful has emerged,” he added. Centre had constituted a High Level Committee headed by Finance Secretary Ashok Lavasa to look into the anomalies raised following the implementation of 7th Pay Commission. The allowances of government employees, along with arrears would only be cleared after the committee submits is report. The allowances are likely to be rolled out following the Union Budget. 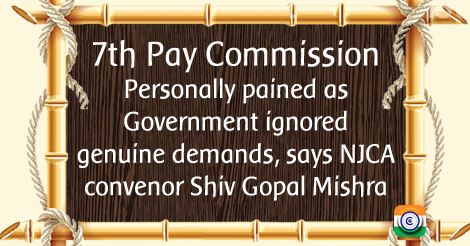 The report of 7th Pay Commission was notified by Union Government in July. Although the salaries have been hiked using 2.57 fitment factor. However, the hike in allowances were put on hold as employee unions had raised objections. The 7th Pay Commission report submitted by Justice (retd) AK Mathur subsumed 37 and abolished 51 out of the incumbent 196 allowances. Apart from the National Council (Staff Side), Confederation of Central Government Employees & Workers have launched a campaign against Centre, seeking fulfillment of 21-point-charter of demands. They have called for a nationwide strike on February 15.